The first step towards building wealth is creating a budget. Without a written plan of what money is coming in and what money is coming out how can you expect to make informed decisions as to what to do? A budget doesn’t have to be super complex. I like using the super basic budget spreadsheet made by Janet at Savvy Spreadsheets. In addition to a budget you also need a list of assets and liabilities to give yourself a starting point of where you are at today in total net worth. All it takes is one moment, 1 conscious decision to take control of your money and change your life. 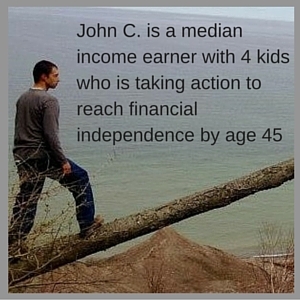 I made that decision in June of 2013 and it shows dramatically on our net worth charts. Once you have a budget in place and have listed out all of your assets and liabilities you need to track this overtime to see the improvements you are making. Use your net worth as your carrot stick and set goals. I use Personal Capital to track our net worth. Personal Capital interacts with all of your accounts and displays them in one place for you. In addition to showing net worth growth overtime one of my favorite aspects of Personal Capital is that it also shows the overall asset allocation of your investments. Incremental increases in the delta between income and spending results in massive increases in savings rate. For the median family, a 10% increase in income coupled with a 10% reduction in expenses results in a 600% increase in savings rate. Taking the time to find ways to make a bit more money and to spend a little bit less money will greatly increase your ability to build wealth. The difference between your income and spending is the only real tool you have for building wealth. Your overall savings rate makes a drastic difference in your wealth building ability. If you want to really build some wealth a 15 -20% savings rate isn’t going to cut it. I highly encourage you to take the Quarterly Savings Rate Challenge to start building wealth quickly. Two important things happen when you pay off debt. For starters you have an increase in net worth for every dollar you pay off, you also free up cash flow with every debt that is paid off. Let’s say you have a car payment of $200 per month with an outstanding debt of $5,000. Over 6 months you pay off the debt, you will have increased your net worth by $5,000 and increased your cash flow by $200 a month. In the example of a car loan you also can free up even more cash flow because once the loan is paid off you can typically buy much cheaper insurance. I follow the Dave Ramsey school of thought on paying of debt. I believe it is best to arrange your debts smallest to largest and pay them off in that order. This gives you wins quicker. Every win gives you motivation to keep going. It’s really hard to stay motivated when you don’t see any real progress if you throw all your money at a higher interest loan that is much larger. Exceptions to the smallest to largest route are if you are being sued by one of the debt holders or if some of the debt is owed to family members. I would pay those off first. A cash cushion is important because it provides security and peace of mind. It also keeps you from having to pay for “expensive money” such as payday loans, credit cards, and personal loans. Having a few thousand dollars in the bank is life changing. It allows you to save even more money because you can often get discounts for paying bills early or in full. You can save money by buying things in bulk when they are on sale. It also keeps a car breakdown or a furnace repair from being the end of the world. Before paying off all of your debt I would recommend having at least the equivalent of a months income in the bank. Once all the debts are paid off, excluding the mortgage, increase this to 6 months worth of expenses. I have never been a fan of actively managed funds or of individual stocks. Index fund investing provides much less volatility at a lower cost and outperforms actively managed funds 80% of the time. and Betterment 100% Stock market allocation fund, which is pretty much comprised of the same funds mentioned above. We don’t know what the tax rates will be in the future, so I believe we need to plan based on the information we have available now. I think it is short sighted when people claim that Roth accounts are better than traditional accounts or vice versa, both have a place in a well balanced plan to build wealth. Pre-Tax Retirement Accounts: This includes 401K plans that often come with an employer match and IRAs. With Pretax retirement accounts you save money by not paying taxes today, but when you take the money out in retirement you will be paying taxes at your marginal income rate. The way the tax system is set up now, between the standard deduction and the personal exemption, a single person pays 0% tax on the first $10,000 of income received per year. Following a 4% withdrawal method you would want 25 times this amount in traditional accounts at a minimum in retirement to ensure you save money on taxes today AND pay NO taxes on that money in retirement. For a single person this means planning to accumulate at least $250,000 in traditional accounts. Health Savings Accounts: Health Savings Accounts are in my mind the most versatile retirement savings account there is. You contribute pre-tax money into it, and if it is contributed through your employer it is deducted from Social Security and Medicare taxes as well. Funds in a health savings account can always be accessed for tax free withdrawals for qualified health expenses AND for long term care insurance. At age 65 funds can be taken out of the account with the exact same treatment as a 401K or an IRA. I highly recommend putting as much money into an HSA as possible. Roth Accounts: Roth accounts are IRAs and 401Ks in which after tax money is deposited into them and on the back end in retirement they can be withdrawn from tax free. A Roth also allows for tax and penalty free withdrawals of contributions at any time. The best time to contribute to Roth accounts is when you are in a low tax bracket. Taxable Accounts: Taxable accounts are often overlooked because there are so many tax advantaged options to choose from, but taxable accounts have some great advantages too. Any stocks held for over 1 year count as long term assets. Long term assets are treated differently by the IRS. If stocks are sold for a gain, taxpayers in the 15% bracket or under pay 0% tax. With proper planning it is possible to slowly “step up” the cost basis in your taxable account to the point where all of the money is seen as investments instead of gains. This is a big help when it comes time to retire. What actions are you taking to start building wealth today?